Parents can upload graded course materials for tests taken on paper, as well as materials for non-Bridgeway courses, through this BLC feature. You and your academic advisor can communicate directly regarding each uploaded document. WHEN DO I SEND MY STUDENT’S WORK TO BRIDGEWAY ACADEMY? Bridgeway does not require that you send in your student’s work at the end of each quarter. However, if your state requires it or you want more frequent feedback, we will issue quarterly report cards upon request. We do, however, require that work be sent in at the end of each semester. Semester deadlines are set based on the date that the curriculum is shipped to you. You will receive reminder emails from your advisor when coursework is due. If necessary, you will have two additional weeks to submit your student’s work without any penalty or fees. WHAT DO I SEND TO MY ADVISOR AT THE END OF THE SEMESTER? At the end of each completed semester, Bridgeway Academy will issue a report card and return it to you via email. At the end of the second semester, return all on-loan resource books, CDs, and DVDs that are noted to be returned. Please send them to Bridgeway Academy, 334 Second Street, Catasauqua, PA 18032. If your textbook is labeled as "final use," you may keep it. Note: As part of Bridgeway Academy’s paperless initiative, tests for Grades Five through Twelve can be taken online. This eliminates the need to mail materials to Bridgeway. If your student takes tests on paper, we encourage you to upload your materials to the Bridgeway Learning Center or Moodle and notify your advisor rather than mailing them. If you must mail materials, make copies of everything so you are not left without them should they be lost in the mail or damaged. In the unlikely event that your student’s work is lost in the mail, you must have some evidence that the work was completed. We will not return your materials unless you request it. Please do not send in large binders and other materials that will not fit in the return envelope. DO NOT SEND IN COMPLETED WORKBOOKS — YOU ONLY NEED TO SEND IN COMPLETED TESTS! How do you want to submit your materials? 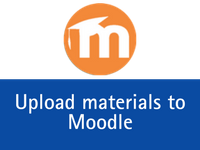 Submitting Materials via Moodle This option is recommended if you are enrolled in Bridgeway courses. Materials for completed coursework should be uploaded directly in each course. Submitting Materials via the Bridgeway Learning Center You may elect to submit your course materials via the Bridgeway Learning Center. This option is recommended if you are a Bridgeway Support student and not taking Bridgeway courses. 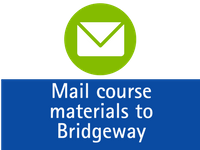 Watch the video below for information on how to upload course materials to the Bridgeway Learning Center. Submitting Materials via mail You may also choose to submit your student's end-of-semester documents via mail. Please use the guidelines below when mailing materials to Bridgeway. Mail your student's documents to 334 2nd Street, Catasauqua, PA 18032. Mail copies of your student's documents, not the originals. If you want your student's materials returned to you, include a prepaid return envelope. Do not send binders or bulky materials. If you are submitting a project or artwork that your student completed, please send photographs, not the actual project. Your student’s report card will be emailed to you unless you specifically request a mailed copy.